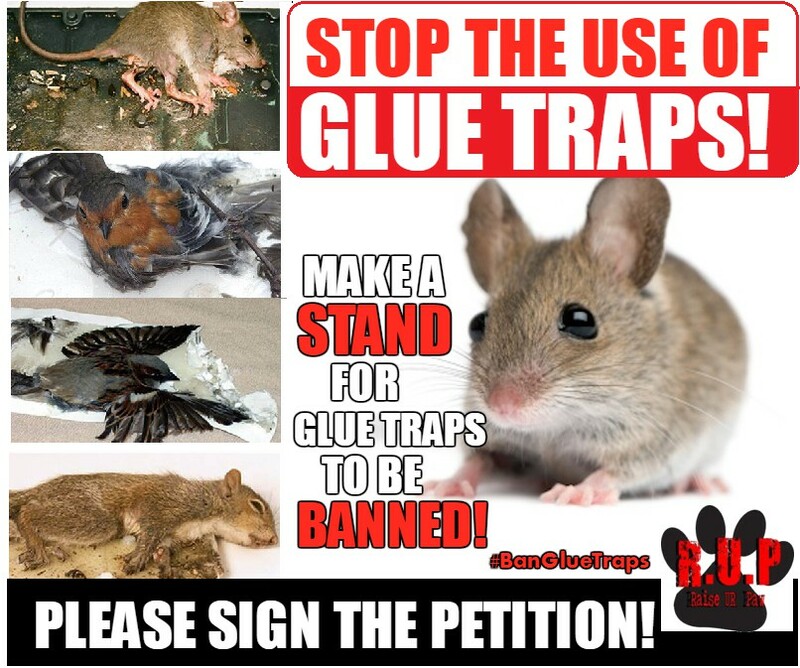 We at RAISE UR PAW, A Canadian Federally Incorporated Not-For-Profit are bringing this proposal to you in hopes of gathering enough support and influence to ban the inhumane devices called GLUE TRAPS. 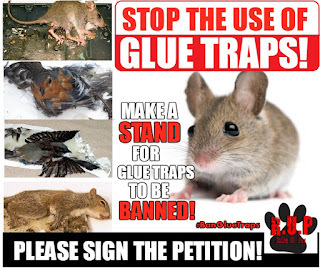 Considered to be the most inhumane, torturous and health risking devices invented for the removal of rodents, snakes etc from one's home, business or place of establishment, these glue traps are also endangering the lives in which it is produced to remove, but also in other animals and even human beings as well - adding risk and injurty to health, life and well-being. Many individuals who are using such forms of removal are unknowingly setting up and/or purchasing devices of cruelty, not fully understanding the effects and process in which these devices inflict upon innocent life and the hazards that they can create. Such companies who are manufacturing and distributing such methods to society, are not providing the consumers with the appropriate information and warnings that these devices should in fact consist of. Individuals observe glue traps as trays in which are covered with an adhesive that kills the life in which it has entrapped -- freeing there residence etc from these "little intruders", as some would call them. However, what many are not understanding that this adhesive in which is used is actually a highly toxic chemical, and that due to these facts and according to sources that using such methods is not a rapid and painless death for such lives, in fact, it is completely the opposite. The rodents and other animals who are victims of these traps, have been known to suffer extremely for the amount of time that it takes for them to perish. Such extreme suffering can come from the intense stress and fear, starvation, dehydration, exhaustion and injuries that can occur from the efforts of trying to escape from this device --- known injuries have been ripped or torn patches of fur & skin, observations in which some of the victims have literally chewed threw their own limbs, or in other cases succumbing to exhaustion and collapsing face-down within the adhesive and suffocating. Such an immense torture can even last up to approximately 3-5 days, depending. However, some of these victims or other animals who have accidentally got caught within these traps have managed to escape, some with extensive injuries, or bringing along with them the adhesive toxic chemical that has remained present upon their fur, feathers etc. In these such cases, if another animal catches and/or devours the "escapee" -- they too can become seriously ill or even perish due to the toxic chemical, or if the animal - such as a pet - consumes the chemical threw trying to lick or remove adhesive from their body. It is imperative to also know that such devices can also pose disease and health risks to human beings as well - even warnings against their use have even been specified by sources due to the fact of threats of viruses that can be spread due to bites, through bodily fluids that have been distributed through fear, stress, and loss of control by death -- or by the adhesive, if improperly disposed of. It is our proposed solution towards this situation that a complete ban be put into effect upon these cruel and inhumane devices in order to show zero tolerance for animal cruelty, to save and protect life from methods of inhumanity, and to prevent any form of health risks that can occur towards animals and/or human beings due to the use of and/or contact with such toxic chemical devices. We are also proposing that companies & industries that manufacture and distribute these forms of "rodent removal" be urged to supply the demand of consumers with humane methods, such as live traps, and make it mandatory that such humane devices be produced instead of such methods that cause torture, suffering and death of such life, or lives that come in contact. Urging Governments to play their active roles in the ban of such inhumane and cruel devices and support fully the ban upon such methods. To reach for assistance and action of distributors, such as hardware stores, department stores and other businesses in which provide such products to consumers and request that they pull their support and involvement in the distribution and selling of such traps. Petition companies & industries that provide these devices to refrain from further development and distribution of these products and request for humane methods such as live-traps be manufactured in order to fulfill the demands of the consumers. To extend our reach to individuals worldwide, to become aids and supporters of such a ban, and make a stand to help us successfully achieve our set goal & spread awareness in order to open the eyes of individuals, Governments etc. to the inhumanity and cruelty that such devices have on the innocent and the health & well-being of life as well. To establish and present public awareness campaigns on the effects of such inhumane methods, distributing effective information and resources and demonstrate the importance of humane methods and alternatives in order to fulfill their demand for "rodent removal" etc. The demonstration of compassion and zero tolerance towards animal cruelty and inhumanity of any kind. Support the fight against animal cruelty and become influences to other business, companies, industries etc. to follow suit in attempts of ending torturous actions and methods against innocent life. Protecting the well-being, welfare and safety of animals and human beings. Reduces the use of toxic substances and/or chemicals that are used to manufacture such devices and within the process of "rodent removal" methods, and therefore reduces the risk of exposure, illnesses, and even death by these chemicals to animals and human beings. Encouraging individuals to choose and become informed of more humane methods to rid their homes, businesses etc of these innocent lives without subjecting them to torture, suffering and death. It is imperative to know that we do acknowledge that such a ban may or may not cause some obstacles to appear with such a change - due to companies and distributors wanting to fulfill the demands of the customers with quick and easy removal of such animals from within their residence and/or places of business. However, such a change and ban will be beneficial, once individuals of our society acknowledge and understand the process and negative effects that goes along with using such methods - especially when it comes to the health and safety risks to our voiceless and human beings with such use. We believe and have faith that we can achieve this goal, in hopes of not just banning an inhumane device, but create another stepping stone towards the prevention of animal cruelty and abuse. We hope that we can count on you to be a voice and make a stand for the innocent, to show that compassion does still exist within the hearts of humanity for animals within our community, in our country and within the world - Let's unite together as one & raise our paws for a better world and future for life.